A Scopus Author ID is automatically assigned to you when you have published a work covered in Scopus. You may have more than one ID in Scopus if you have published under variant names and affiliations. It is always a good practice to merge your multiple Scopus IDs and keep all your works listed under one unique ID. This ensures that your total citation counts and h-index in Scopus are accurate. 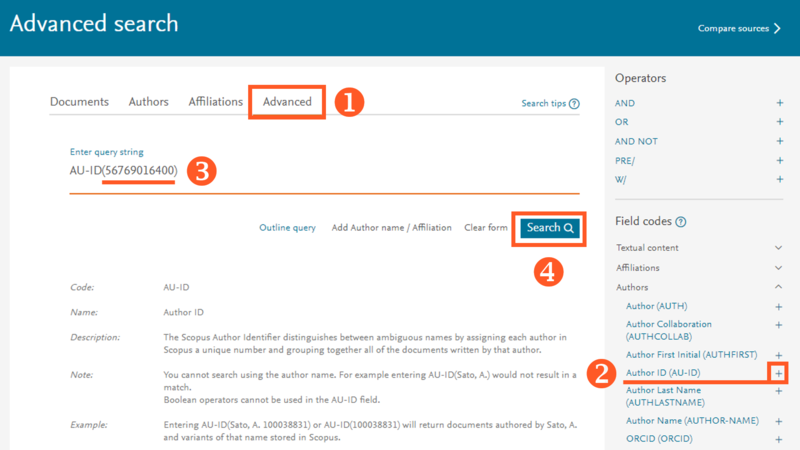 By following the steps below, your multiple Author IDs in Scopus can be merged along with the integration process. You may also request a merge separately by using the Scopus Author Feedback form. Refer to this page for details. You can only add publications from Scopus to ORCID, not the other way around. Option 1 - from Scopus "Add to ORCID"
Option 2 - from ORCID "Search & Link"
Click the tab "Author Search" and fill in your last name, first name (or initials). Do not include Affiliation information (e.g. Hong Kong Polytechnic University) if you have published with multiple affiliations. b) If you have known your Scopus ID, you can access your author profile by searching your Scopus ID under "Advanced Search". Choose from the pre-defined field codes​ on the page, or simply key in "AU-ID(#YOUR SCOPUS ID)" and search. 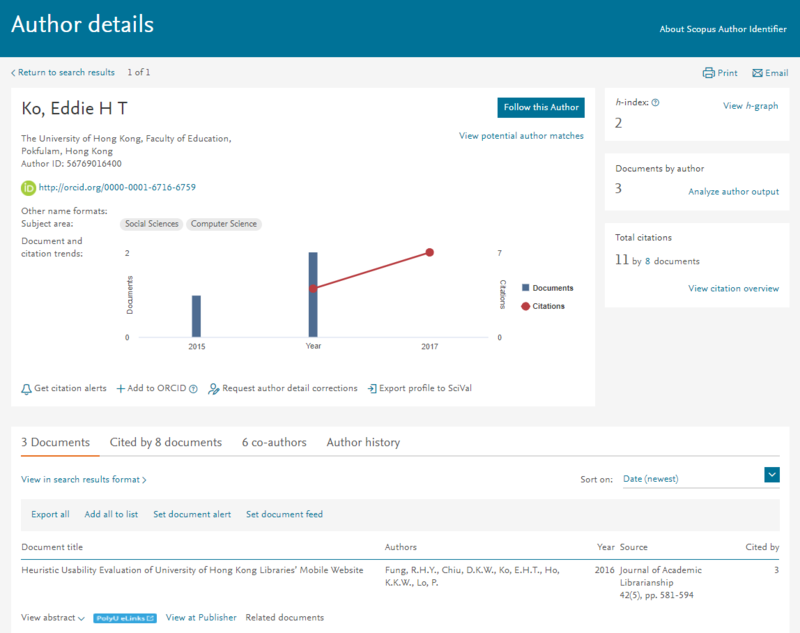 The result page lists all your publications under your Scopus ID. Click on your name (from any publication) to access your author profile. 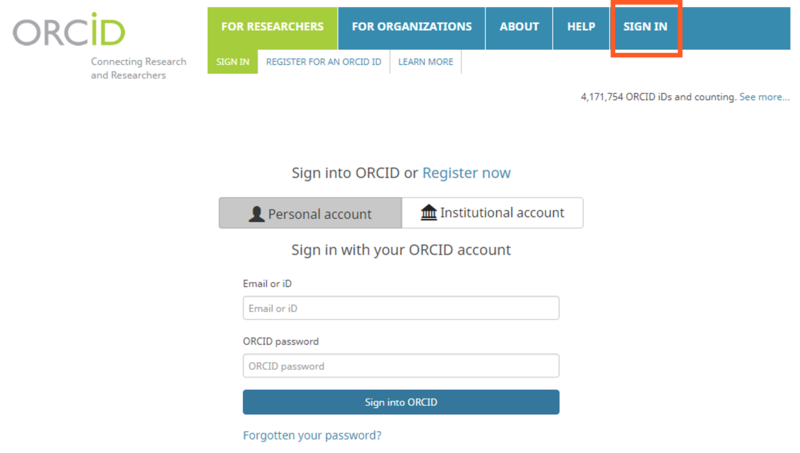 If you have registered an ORCID account, click "Sign into ORCID" to log in to your existing account. Click "Authorize" to allow Scopus to add publications to your ORCID profile. Go through a few steps here to complete the integration process. After this, your publications will be sent from Scopus to your ORCID profile. If you select multiple profiles or add in missing publications during the process, your Scopus ID and the associated publications will be updated as well - but the change will take 2-4 weeks to be reflected in Scopus. Select the profile(s) that contain publications authored by you and click "Start". If you do not see any profiles that pertain to you, please leave the profiles unchecked and click "Start". Select a preferred name from the pull-down menu. It is good to select the name you use in your publications. Review the list of publications and click "X" to remove those that do not belong to you. Click "Search for missing documents" to search for publications that are not on the list. Search by title will give more accurate results. Double check if all your publications are included in your profile. If not, click "Back" and search again. 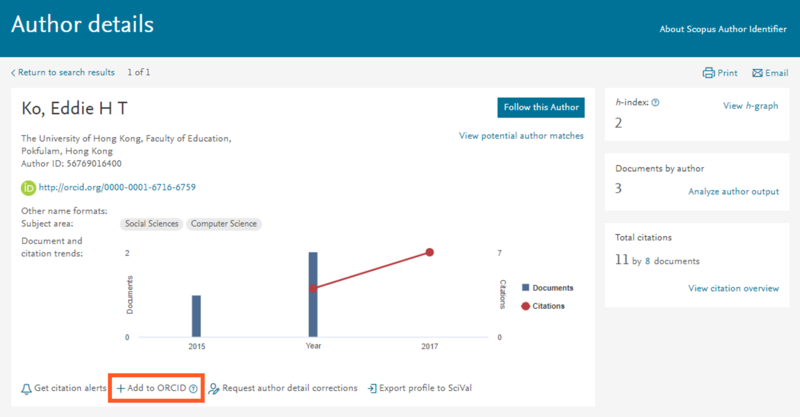 If you selected publications and names which are different from your Scopus author profile, you will be asked if you would also like to update your Scopus profile. Click "Yes, update my Scopus author profile" if you wish to update your Scopus profile at the same time. Enter your email address twice and click "Send Author ID"; after this, your Scopus ID will be displayed in your ORCID profile. 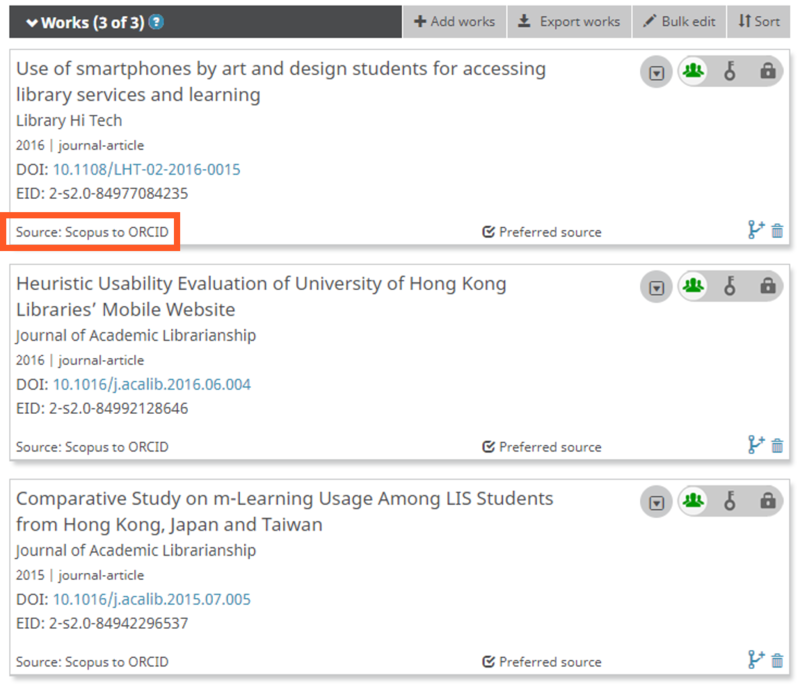 Click "Send my publication list" to add your publications to ORCID; after this, your publications in Scopus will be added to your ORCID profile. Finally, "return to ORCID" to see the publications added to your ORCID. Return to your ORCID: publications have been added, with source "Scopus to ORCID". Step 2. 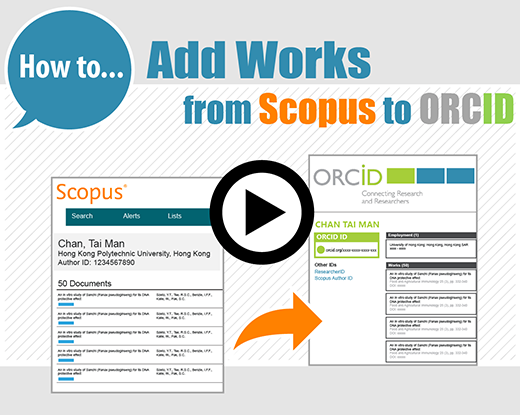 Choose "Scopus to ORCID"
Step 5. 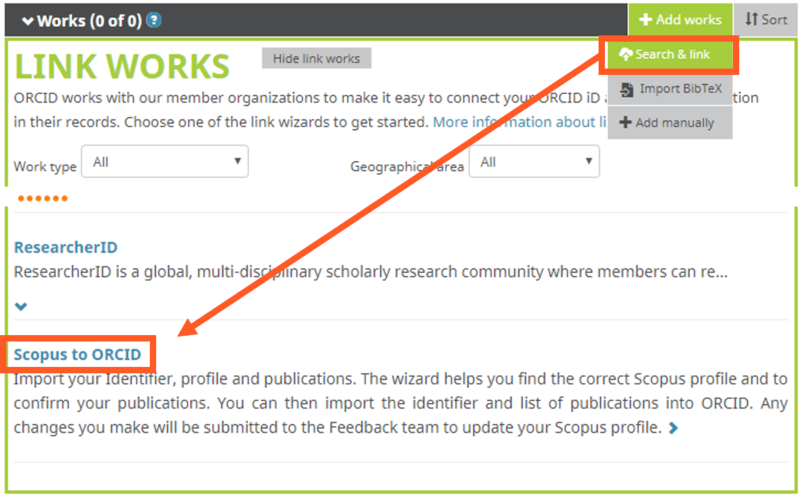 Add publications to ORCID - refer to Step 4 of Option 1 - from Scopus "Add to ORCID"
You may add affiliation (e.g. Hong Kong Polytechnic University) to narrow the search or add name variant to broaden the search (to find multiple profiles if any). Author profiles that match your name will be displayed. Select the one or more profiles that belong to you. 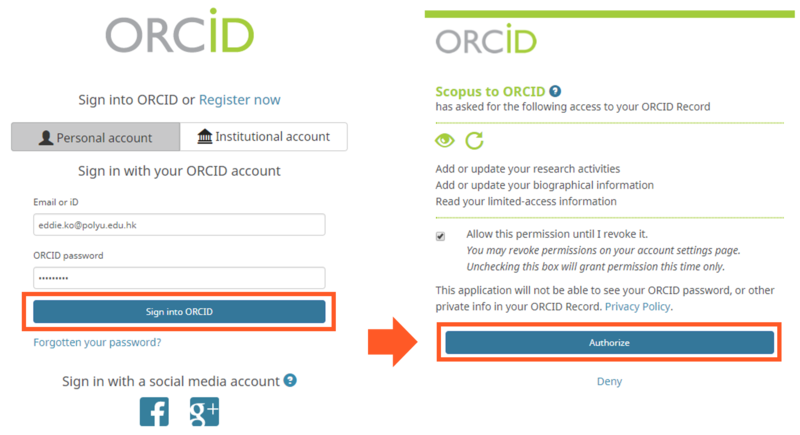 Refer to Step 4 of Option 1 - from Scopus "Add to ORCID".